MSK 009 Coiler VCF - North Coast Synthesis Ltd. 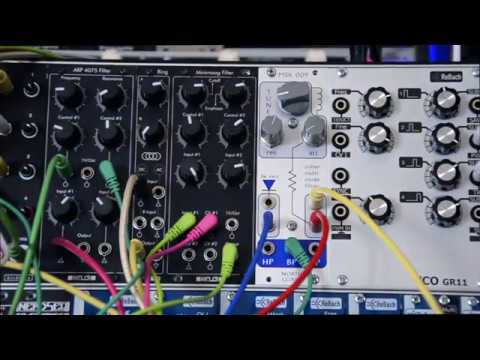 The Coiler Multi-mode Filter and Rectifier packs an entire nest of sound-shaping features into a single 8HP Eurorack module. It's a two-pole state-variable filter based on a unique integrator design which stores energy in both inductors and capacitors depending on the frequency range. The transition region between the two components, and the saturation characteristics of the traditional OTA-based amplifiers, offer warmth and ever-shifting timbres in the midrange, along with hissing highs and slithering lows. This is a somewhat unpredictable filter. With simultaneous low-pass, band-pass, and high-pass outputs, the Coiler works well in traditional subtractive patches. 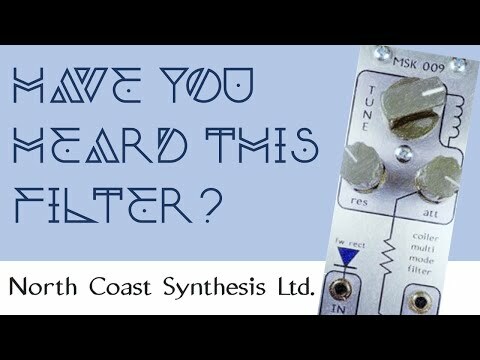 But its built-in full-wave rectifier is also great for adding harmonics and distortion in patches from the other coast. When combined with low-pass, the rectifier allows the Coiler to serve as a basic envelope follower, for compression and external-signal patches. It's a lot of bite for the buck, and for the rack space. 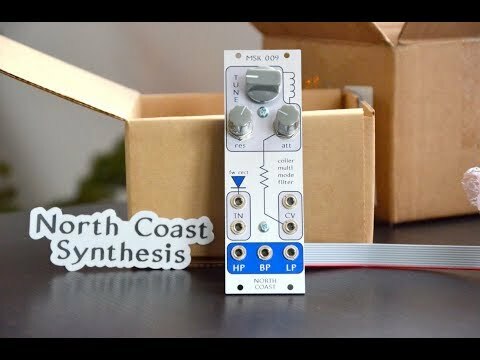 The MSK 009 Coiler VCF is available as a pre-built 6HP Eurorack module or a DIY kit. Slide one into your rack today. Smooth-touch conductive plastic potentiometers, rated for one million operationss. No compromises on build quality: real aluminum panel, not PCB material, with colour printing; nickel and gold plating on the circuit board; close-tolerance metal film fixed resistors. 8HP Eurorack synthesizer module, 46mm deep. Maximum current requirements in normal use: 25mA +12V, 25mA -12V. Reverse-connection protected. Build difficulty: easy. All through-hole. Voltmeter required for adjustment. Click titles for patch notes; and visit our audio server for more tracks made with the MSK 009.